It's now 2015, and responsive web design (RWD) is no longer a buzzword. In fact, it has not been a buzzword for several years, but, even though RWD is not new, only a small percentage of law firms have developed responsive sites. In a survey by Urban Insight presented at the Legal Service Corporation Technology Initiative Grant Conference in January 2014, only 14 percent of the 153 legal sites reviewed were using responsive technology. Those numbers continue to increase, but are way behind where they should be in today’s mobile market. And, while some law firm website designs may have responsive properties, they are not fully responsive to adapt to small-screen devices. With the array of available screen sizes in today’s mobile world, and the ever-growing number of mobile devices surpassing desktop computers, the need is even greater today that your law firm website effectively deliver content not only to the user but to the user’s device. Simply defined, a responsive website is one that adapts and responds to a particular device an individual may be using, such as a tablet or smartphone. The site not only adapts to the device, but adapts when the orientation changes from portrait to landscape. A well-developed responsive site will optimize the user interface, content and visuals before displaying them in a way that is easy to view and easy to navigate. Responsive sites are more than resized versions of the desktop site. They have the ability to reorganize content and resize visuals to give some elements a higher priority over others. Cost effectiveness: In the early stages of mobile devices, it was determined that the best way to present a website on a mobile platform was by creating a second “mobile” site. This often took away elements that would normally be part of the desktop experience. While this allowed you to deliver content and visuals that were properly formatted for the mobile device, it did require developing and maintaining two (if not more) different websites and content management systems. Improved SEO: Google has clearly indicated the importance of the mobile user experience and has even confessed that they are “experimenting with mobile-friendly criteria as a ranking signal.” Also, having a consistent URL enables search engines, such as Google and Bing, to crawl each URL more efficiently – once instead of multiple times for each version, thus allowing for better rankings and results. Better performance: When designed and coded properly, the back-end of your responsive website runs faster. This means that the site will deliver the user information more efficiently. More efficient information delivery translates into quicker download times, which is essential on a mobile platform. We can no longer think in yesterday’s defined website standards of HTML tables and pixels. Today’s sites need to adjust on the fly to resize and reflow at various dimensions (or breaking points) based on the device and its orientation. When developing a responsive website, more time and thought has to go into the initial wireframe and design to ensure that the user experience is not hindered as the site adapts to different devices. Speaking of devices, never before have we been able to view websites on so many different ones. 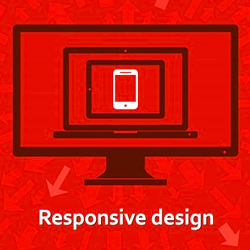 Responsive web design offers us a way forward. Just last month, Jaffe launch its new responsive website. In working through the design and layout, we gave great consideration to how content and images repositioned themselves from desktop, to laptop (yes, there can be a difference), to tablet and smartphones. The end result is a website that maintains our branded look across all platforms and is user-friendly at any size. If your law firm website is not responsive, isn’t it about time to add that to your 2015 list of projects? If you have any questions or comments about responsive web design, contact Alan E. Singles at asingles@jaffepr.com.